Children across the land can thank Kabalevsky if they actually enjoy their piano lessons. Dmitry Kabalevsky is a composer many piano students would recognize – he wrote countless little pieces that show up in Canada’s Royal Conservatory of Music’s repertoire books from about grade 3 on up, often with descriptive titles like “Clowns”, “A Little Joke”, “Toccatina”, “A Little Song”, and countless studies. Kabalevsky’s music didn’t quite reach the standard of Prokofiev or Shostakovich and isn’t commonly part of the standard repertoire of professional symphonies, chamber musicians, or soloists. Once in a while you’ll see his orchestral work “The Comedians” programmed, or his Piano Concerto No. 3. Kabalevsky’s biggest legacy is his contribution to music education, and connecting kids to music. He wrote music specifically to link that stage in a piano student’s studies when they’re approaching the advanced level; and composed works with the technical skills needed to sound more sophisticated, closer to the professional level. He also set up music education programs in 25 Soviet schools, and even taught seven year-olds how to listen attentively and put their reactions down into words. He wrote about this project, which was turned into a published report in the United States a year after he died. This piece, “Dance on the Lawn” (this is the title I recall; here it appears as “Meadow Dance”) I learned when I was a young child. I remember noticing the jumping pattern in the left hand, and how the notes were always in a triad formation. I was taught analysis, an important tool in learning and memorizing music. I’m so grateful for all the Kabalevsky pieces I learned growing up. 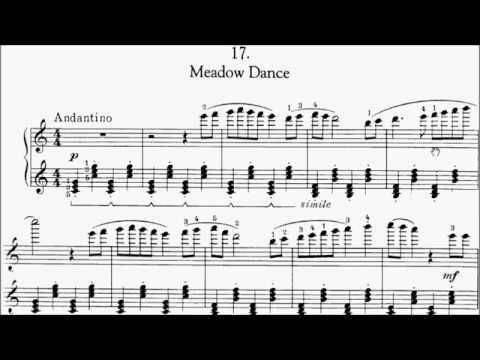 Here’s the delightful “Porcupine Dance”, which to this day, cracks me up, and is one of the pieces I still teach. I love how Eric Liu counts himself in. Dmitry Kabalevsky was born on December 17, 1904, in St. Petersburg, Russia, and died on February 14, 1987 in Moscow, in what was then known as the USSR.